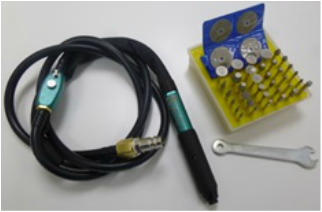 In addition to our 'Step Sanding Tool Kits' we also provide a range of traditional air tools used for the repair of composite parts. 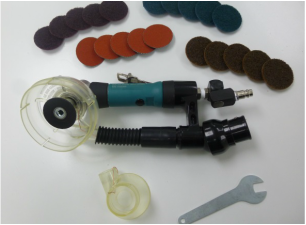 All the kits are supplied with a selection of abrasives that are suited to a range of composite materials. The extracted tools are very effective at dust capture at source to make for a cleaner, safer working environment. A versatile disc sander that has variable speed and can be used for quick and aggresive composite material removal through to blending and surface finishing. The 3M Roloc silica carbide abrasive discs allow agressive material removal from edges and surfaces. The 3M Roloc surface conditioning discs allow for blending and surface finishing depending on the grade used. Ideal for dust free sanding of vertical, sloped and horizontal surfaces and edges and is suitable for production and on-site sanding activities and repair activities. The 50mm/2" disc combined with the 75mm/3" vacuum shroud provides dust free sanding operations with dust capture at source when combined with our portable dust extractors. The vacuum shroud supplied can be trimmed back to suit the parts being worked. This tool is extremely effective for fine material removal and detailing operations. 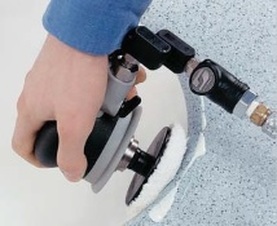 A variable speed random orbital sander used for the blending of surfaces and fine surface finishing. 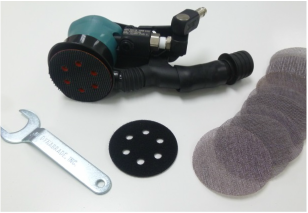 The small orbit and contact area, combined with Mirka mesh abrasives, provides dust free sanding operations with dust capture at source when combined with our portable dust extractors. Ideal for dust free sanding of vertical surfaces and edges and is suitable for production and on-site sanding activities. A variable speed polisher used for fine surface finishing of resin, painted and gel coated surfaces. Orbital sanding head included in the kit to allow for use as a random orbital sander also.